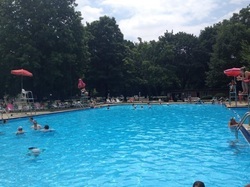 One of the largest summer swimming facilities in Northern New Jersey. ​2019 memberships available for residents and non-residents. 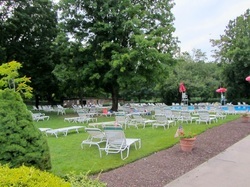 The New Milford Swim Club is a private summer swim facility with membership available to﻿ residents﻿ and non-residents. The Club is located a short walk behind Borough Hall, right off of River Road. The serene grounds and pool facilities provide a clean, shaded and relaxing atmosphere for people of all ages. Have fun and enjoy yourself at the main pool, lap pool or kiddie pool in the comfort of a club provided chaise lounge or chair. With an extensive picnic area containing tables, grills and a children's playground family and friends can spend the summer relaxing and reconnecting.